What exoplanet discoveries are yet to be made? 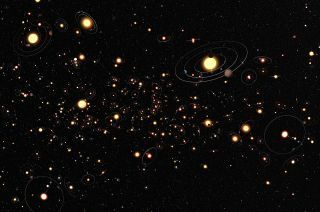 At the 2012 Astrobiology Science Conference, Astrobiology Magazine hosted a plenary session titled: "Expanding the Habitable Zone: The Hunt for Exoplanets Now and Into the Future." Originally formulated as part of our "Great Debate" series, this panel of exoplanet hunters and thinkers held a lively discussion about some of the most important issues facing the search for and understanding of alien worlds orbiting far-distant stars. In the final installment of this 10-part "Hunting for Alien Worlds" series, the panelists and audience members give their thoughts on exoplanet science today. David Grinspoon: I guess it will eventually, but we could be too too careful. I mean, I bet you more people know about the planet Nibiru that doesn't exist then know about Gliese 581 d.
Doug Archer: Yes. And then the last comment that I just want to say. I appreciate the efforts of one of the panelists that brings the small engineering model. And to be working on something like that, because I think that one thing in planetary science and space science in general that's just killing us is the growth and complexity of missions. So when you go from one instrument to two instruments, it doesn't double the cost, it squares the cost or it cubes the cost. So instead of saying to the American public or world at large, "This is really cool, please give us more money", we need to be figuring out ways that we can do this better, for the amount of money that we have. Because frankly 17 billion dollars a year is a lot of money. And as a scientist I look at that and I see how a lot of that is spent, and I'm not confident going to the American public and saying yes, every dollar that you are giving us is being well-spent. And so projects that you're working on, I think that's the future. We've got to figure out how to do it cheaper. And as scientists, we can really help do that. And once we go in that direction we will amazingly find this increase in capability as we start driving costs down. So I just wanted to say thank you for working on stuff like that and encourage everyone else to get involved with stuff like that. David Grinspoon: Over here. Yes? Audience: Hi, my name is Sarah Rugheimer. I went to an event at MIT recently about standing up for science where it involved the media and how scientists can better talk with the media. And the question that I had at that conference, I'd like to pose to the panelists: Is there a problem we've had several maybe contentious press releases over the past year and a half? And when I talked to a lot of people who are non-scientists, I tend to find kind of two opposing attitudes. One where they completely trust some science. And the other one where they completely distrust some science. And you can see this in the case of maybe global warming, some medicine issues, stuff like that. And so my question is, Do you think when we, because of wherever the miscommunication gap happened, it plays into a larger problem in our society where propagating distrust of science, and that might actually have big impacts in so far as people getting cancer treatment, or global warming, stuff like that? Sara Seager brought to the panel discussion a model of a lower-cost nanosatellite dedicated to exoplanet discovery. This image reveals the inner workings of a standard nanosatellite. David Grinspoon: I'll take first crack at that, and then I am interested in hearing what the other panelists have to say. But I work at a science museum and interact with the public almost everyday. And in my view, what you are identifying is a real problem. Because the most visible aspect of science probably these days is the so-called global warming debate, and the press feels obligated to present both sides of everything, whether or not there are two legitimate sides, the credibility of science is taking a hit right now in this fight that we didn't necessarily pick, but we're in. Not the fight over whether global warming is real, but the fight for the creditability of science, given that there are forces at work that are threatened by some of our science and interjecting non-honest skepticism into the debate. There is honest skepticism and it is very very important. But there is dishonest skepticism that's fueled by some other kinds of motivations. And I won't go into this, I think you all know what I am talking about. But the optimist in me went to FameLab last night. How many of you were at FameLab last night? That's a lot of you -- great. And I think just seeing the fact that all of these young scientists are so good at communication and so interested in communication, and in fact our community is doing a much better job than I think any other scientific community possibly has ever done in emphasizing the importance and giving appreciation and training to young scientists in communication. To me that's the answer, there's no magic bullet here. But if we all go out and tell our stories in a compelling and clear way then we can keep people interested in and respecting science. Sara Seager: Hold on. Let me just interrupt. There's a correction involved here. That is: people keep claiming the first habitable planet, and as far as exoplanet astronomers go, there's no agreement that there's any habitable planets. Gliese 581 d gets an honorable mention, so that's the problem. Audience: Yeah, right. So, it has to be framed probably in a correct way and we can’t control the press like Eric was saying. But I don't see any problem in keeping the public talking about discovering habitable planets. And I don't agree with you actually, I am sorry. David Grinspoon: That's okay. That's why this is a debate and not just a discussion. But, thank you. I see that there are four people standing up and we have the room for six more minutes. So let’s move it along, but we'll try to see if we can allow for all these comments. Eric Ford: I'll take the opposite viewpoint. They think they understand it but really they have no clue. Audience continued: Doesn't matter, at least they tag that to the news. And they could comment about the investment the previous person was talking about, that we are asking for too much money in science and technology; that’s not right because the amount of money that each country in the world spends on defense is exorbitant. If every country puts 10 percent of its defense budget into education technology and learning, we would have a much better world than what we have today. So yes, we need to get better technology, we need to get smarter, we need to do all those things. But put the money in the right place so that future generations can be benefited by them, not destroyed by them. David Grinspoon: Thank you. Yes? Sara Seager: These things usually just evolve by consensus. Personally I've given up on any organized route to doing anything. I will say that the Terrestrial Planet Finder science and technology definition teams, which existed for about a decade, spent many many hours debating this. And we actually do have a list. So maybe we should try and circulate that, and then I think most people would actually agree. David Grinspoon: Wonderful. Okay we have two minutes and we have one question left. So make a very profound last point please. No pressure. One attempt to classify exoplanets. Audience: I just wanted to say real quickly that, despite how it feels sometimes, it can be just as hard to communicate with someone as it can be to find an extra-solar planet. And that one of the wonders of the Astrobiology community is that we have people who specialize in this. So I really encourage people, if you find something important, before you announce it, talk to some of the wonderful communications people here. There have been examples recently, we won't name names, that a little bit of prep work with some of the people like Linda, who specialize in these sorts of things, will really help the field. Thank you. David Grinspoon: All right. Thanks a lot. We're coming to the end of our session here. Do any of the panelists have any points that they’re itching to interject? Okay, well I will simply thank all of you for attending and thank the panelists and enjoy the rest of the conference. Thank you.